There are many different types of graduate level opportunities. To find out more about them and where to find them check out our pages on finding a job. The Careers Centre offers a huge vacancy database, including graduate level jobs and internships in a wide range of sectors. Applications for graduate opportunities are at an all time high. Ensure you are submitting a strong targeted application by checking out our tips and advice on our application pages. Here you can also find information on the next stages of selection with advice on interviews and assessment centres. Did you know the Careers Centre will check your applications, offer a mock interview and expert assessment centre insight. For specialist one-to-one advice come along to our drop in service. Check out our further study pages for information on your options. 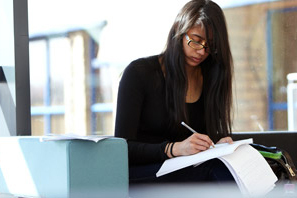 When you're ready to apply, check out our advice on writing a successful personal statement. Through our drop in service we can help you identify postgraduate options that may be of interest, possible sources of funding and work out the best application timeline for you. We will also give you feedback on your personal statement and help you refine it. I have been applying for opportunities and so far I have not been successful. We know how disheartening this can be, especially given the time it takes to complete application forms. Remember, the market is very competitive at the moment so it is harder to be successful at the application stage. Check out our pages on CVs applications and interviews for information and advice on all stages of the application process. Did you know the Careers Centre will check your applications for you? For expert one-to-one advice, bring your application form or CV along to our drop in service. We can also offer you assessment centre advice and mock interviews. If you are away from campus you can also get applications checked via our online guidance service, MyCareer Questions. Looking for a graduate job? Check out our vacancies website.